The Phoenix Park’s association with motorsport started as early as 1903. The Gordon Bennett Cup Race which took place in Ireland in that year is cited as the background for James Joyce’s short story After the Race. Joyce used motor racing to lampoon the aspirations of Dublin’s social climbing nouveau riche. It was one of fifteen stories that appeared in Dubliners and this month marks the 100th anniversary of its publication. A reimagining and rewriting of these stories, Dubliners 100, will be launched today. This lady was photographed in the Phoenix Park sometime in the late 1940s or early 1950s. Due to petrol rationing racing was suspended during the Second World War and did not re-commence until the late 1940s. On the subject of rationing, I was delighted to have my article ‘Coupons, Clothing and Class: The Rationing of Dress in Ireland, 1942-1948’ published in the latest issue of Costume. 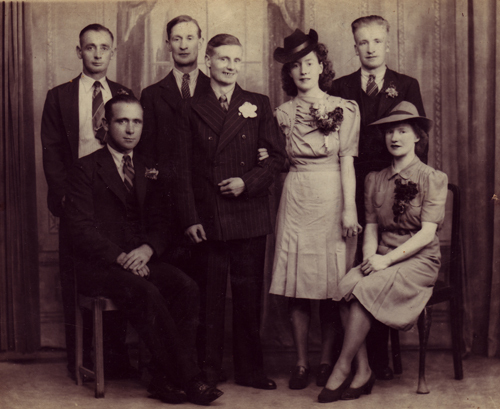 The fashions worn by this women indicate that the photo was taken towards the end of the 1940s or in the early 1950s. 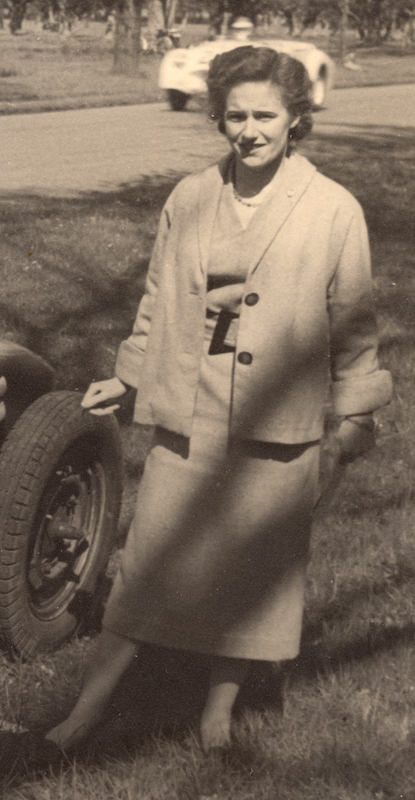 Her loose fitting, midi length shift dress and matching jacket were typical of the post-war period. 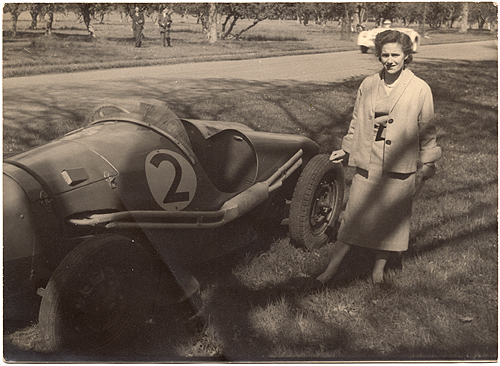 Her stylish outfit reflects the comparative wealth of those involved in motor sport and mirrors the glamour and allure alluded to by Joyce in After the Race. 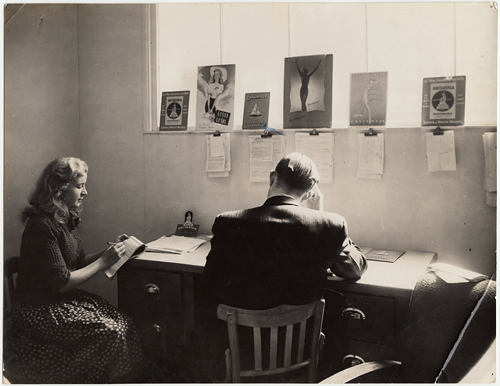 Even though people spend many of their waking hours at work, the office is seldom photographed or shown as clearly as it is in this series of images taken in August 1948. 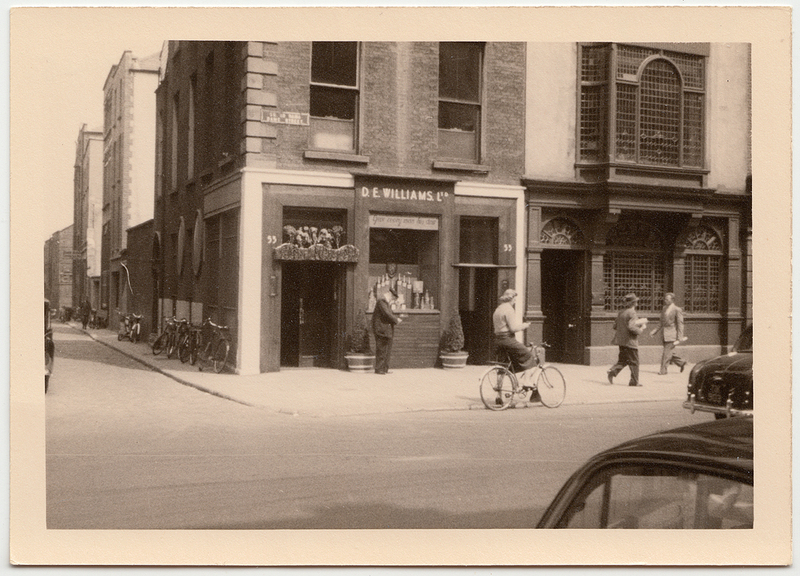 These photographs are of a Dublin clothing wholesalers called Robert P. Shaw and Sons, which was located at 46 South William Street for two years’ between 1948 and 1950. The location was the centre of the ‘rag trade’ in Ireland and an area which up until recently housed many wholesalers and workshops. The Georgian building was partitioned into many units and street directories show that in 1949 there were at least five other businesses and two residential units at number 46. These included Cunningham & Co., manufacturers, importers and wholesale warehousemen and Farrell & Co., typewriting and duplicating services. I was able to deduce the location by enlarging the address on an envelope resting beside the classic Underwood typewriter. 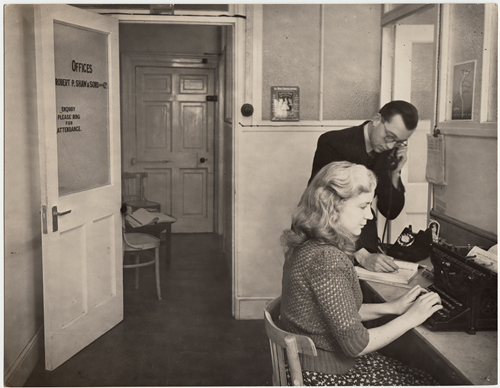 A little card on the noticeboard refers to the tardy closing of the front door and the fact that the staff of Cunningham & Co. vacate the building promptly at 6 o’clock every evening! The secretary’s office is of particular interest and shows a calendar opened to the weekend of the 21st and 22nd of August. I love her sweater and waved hair which were very typical of the period. 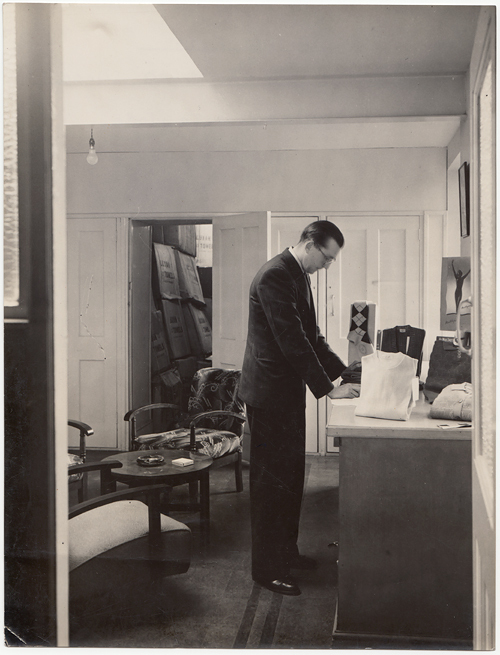 The photographs have a formal quality which is rather like the set of a play. There are many details to take in, for example, the beautifully designed advertisements for ranges such as Luxan, Francella and Daphne. 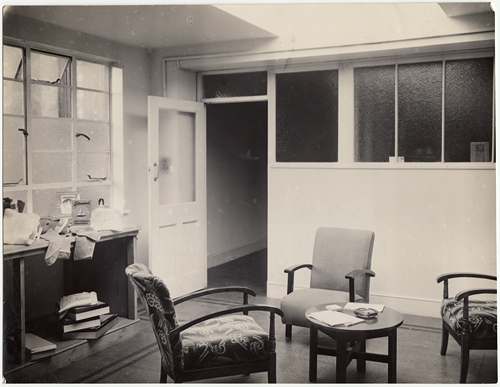 The sales room has some chairs which were upholstered in a contemporary fabric and the circular table is complete with an ashtray for the waiting salesmen. 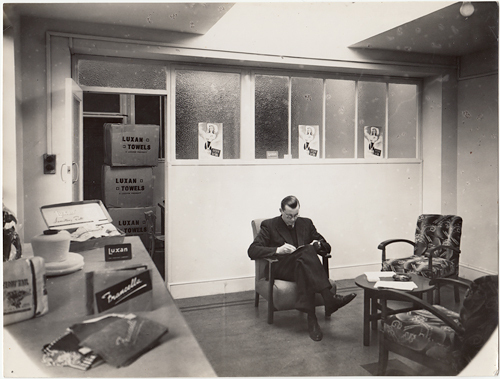 Notes on the the photographs refer to the interior features in a manner indicating that the offices had recently undergone a renovation, for example, one caption highlights the ‘effective use of cork tiles.’ By 1951, however, Robert P. Shaw and Sons were gone from the location and the unit was filled by another clothing agent. Perhaps, their line in Shamrock and Britannia unshrinkable all wool underwear was no longer popular! The photographs were commissioned from Keogh Brothers, a firm who are better known for their images of the aftermath of the 1916 Rising and for several commemorative albums which they created during that period. There is an excellent StoryMap feature on South William Street’s connection with the garment industry and Ruth Griffin’s research into the history of the district provides a great picture of this most interesting street. 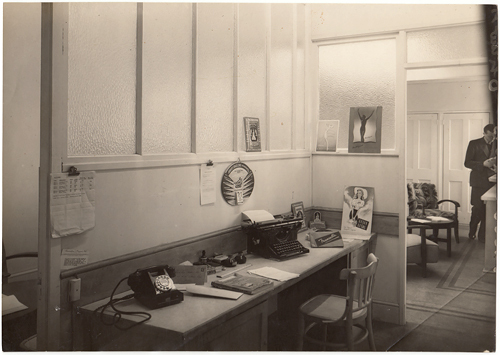 Overall, this series of photographs gives us an atmospheric glimpse of mid-twentieth century working life. This glamorous lady was photographed as she walked by the railings of Trinity College in 1948. Her outfit adheres to the styles of the day: a black Mandarin hat complete with spotted veil; trapeze swing coat; clutch bag; gloves and a large leaf-shaped brooch. All were the height of fashion for 1948! The handwriting on the print adds to rather than detracts from the photograph and although it is not a perfectly composed image it gives a real sense of Dublin in 1948 and shows how clothes were worn and fashions adopted on the street. The Grafton Cinema was showing Spencer Tracey and Mickey Rooney in Boys’ Town and the Carlton Cinema advertised the following: ‘Gorgeous and Gay! Exotic and Exciting! Lovely glamorous Yvonne de Carlo with George Brent, Brod Crawford, Andy Devine and Arthur Treacher in Slave Girl – dazzling Technicolor! Come to the 3.30 show – house booked out for tonight!’ If you didn’t want to go to the cinema there was always ‘Midget Car Racing’ at Santry Speedway or horseracing at Baldoyle. Speaking of street style, the Where were you? team are putting on an exhibition of images from their Dublin youth culture book. It is part of the amazing Photo Ireland Festival 2012 and is at the Lighthouse Cinema, Smithfield from Saturday 7th July. I am giving a talk in August on the subject of Irish fashion during World War Two and in preparation I had a look at some of my photos from the 1940s. 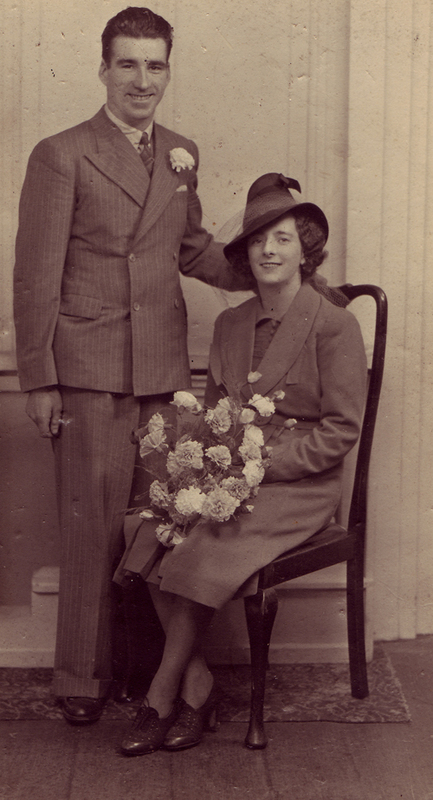 As these two Dublin wedding portraits demonstrate, the slouch hat was a ‘must-have’ for any fashionable women. Tilted or asymmetric hats of all styles were very popular including the topper . The July 1944 advertisement boasts that the high-end Dublin department store Slyne’s was selling slouch hats in a variety of colours. Neither bride wears white and both of them have sensible shoes and outfits which could be worn again for everyday use. Interestingly, both grooms are wearing double-breasted pin-striped suits with large lapels. The trousers are wide-legged with turn-ups. What I like about both these studio portraits is that they show how regular Dubliners embraced fashion trends and that despite the formal studio setting and poses, the sitters’ personalities still manage to shine through. This striking portrait was pasted down in an album containing mostly Dublin images. Unfortunately, I have no way of seeing if there is any information on the back of it. The woman’s hair, makeup and clothing are typical of the 1940s. Dark lipstick, with the top lip slightly exaggerated, was also popular during this decade. When researching the fashions of this era, I find the following titles invaluable: Jonathan Walford’s Forties Fashion:From Siren Suit to The New Look (2010) and Colin McDowell’s Forties Fashion and the New Look (1996). The unusual numerical pattern on the above dress reminds me of a 1941 fabric called ‘Coupons’ which was based on the number of ration coupons required for certain types of clothing during the World War Two. This pattern was reproduced by Persephone Books for the endpapers of their beautiful edition of wartime stories by Mollie Panter-Downes entitled Good Evening, Mrs Craven. In Ireland, clothes rationing was announced by the Minister for Supplies on the 8th June 1942. See Clare County Library’s site for examples of Irish ration books in their collections.